Hear our new SDGs Song! Developed — since 2010 — from NIGH's global networking, a multi-disciplinary team of Ugandan citizen activists have recently established our first African NIGH 'Circle' called 'NIGH Uganda' — to provide fresh innovations to address the needs of African peoples. In particular, this newest NIGH team is focused on achieving the UN's 17 SDGs in Uganda and throughout East Africa. ​For many years, NIGH Uganda’s co-founders (see below) have collaborated at village levels to overcome suffering from violence, tyranny resulting in poverty and poor health. Included on our ‘NIGH Uganda’ team are leading nurses, midwives, teachers and youth activists who are working with NIGH from the Great Lakes Peace Center — an NGO honoured at a UN Ceremony in Bonn, Germany — for their leading-edge work to ‘localize’ the SDGs by sharing SDG values in Swahili and other East African local languages. Registered as a not-for-profit Ugandan NGO, the Great Lakes Peace Center's activities cover Uganda, Kenya, Southern Sudan, Rwanda, Burundi, Tanzania and the Democratic Republic of Congo. ABOVE" This photo illustrates how the Great Lakes Peace Center services young generations in schools and communities with education for human rights, gender issues, conflict resolution, leadership, peace-building and empowerment and, above all, capacity-development of youth in the African 'great lakes region'. ​Used with permission from the Great Lakes Peace Center. As one of their first innovations, the NIGH Uganda founders have initiated a music project to prepare a SDGs Song for Ugandan school children to sing and perform — aiming to share this song on YouTube — to increase public awareness of the UN SDGs and eventually to be made available for children to sing across Africa, in both Swahili and English. They have commissioned Ms. Juliet Mugirye — the international gospel songwriter and performer — to compose this song and prepare the first group of students to sing it. Ms. Mugirye’s most famous song “Wele-Weffwe” won accolades at the Pearl of Africa Music Awards (PAM Awards), in the category of Best Gospel Artiste in Uganda. Over the years, her music has been appreciated by a cross section of people because it cuts across generations — touching the young and the old — in Uganda and with the East African Diaspora, worldwide. ABOVE:, two photos from the Summit View Primary School in Kampala, Uganda, where composer Ms. Juliet Mugirye plays her guitar to accompany some of the school's children preparing their new 'SDGs Song.’ Assisting her at the blackboard and in the picture on the right is the Summit View Primary School music teacher Mr Akena Geoffrey, also conducting the children who are already rehearsing. Photo from Andrew Mukhwana, used with permission. 'Fauza' is a leading Nurse who collaboratew with and oversees the work of health professionals in five District Health Services in the southwest mountainous region of the Uganda, on the borders with Rwanda and the DRC (Democratic Republic of the Congo). 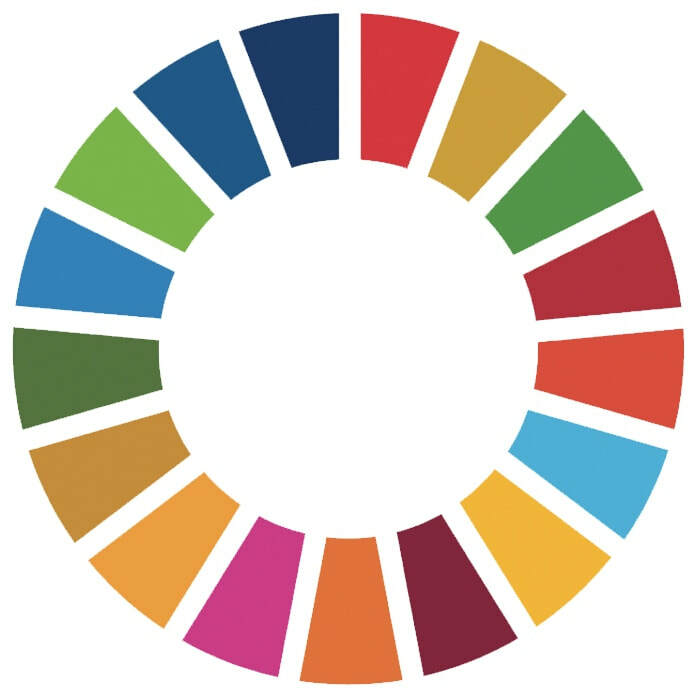 ​Upper right United Nations SDGs Color Wheel used with official UN Guidelines.